West Nile virus (WNV) is the most commonly transmitted virus to humans by mosquitoes in the U.S. Fortunately, most people infected with WNV will have no symptoms. According to Centers for Diseases Control and Prevention (CDC), about 1 in 5 people who are infected will develop a fever with other symptoms and less than 1% of infected people will develop a serious, sometimes fatal, neurologic illness. West Nile virus first appeared in the United States in 1999 (Figure 1) and subsequently spread throughout the U.S. and into Canada, Mexico, and several Central and South American countries. Cases have been reported from every state except Alaska. It took only a four years for the virus to spread across the entire country causing major epidemics along the way (Figure 2). Figure 1: Source: CDC. 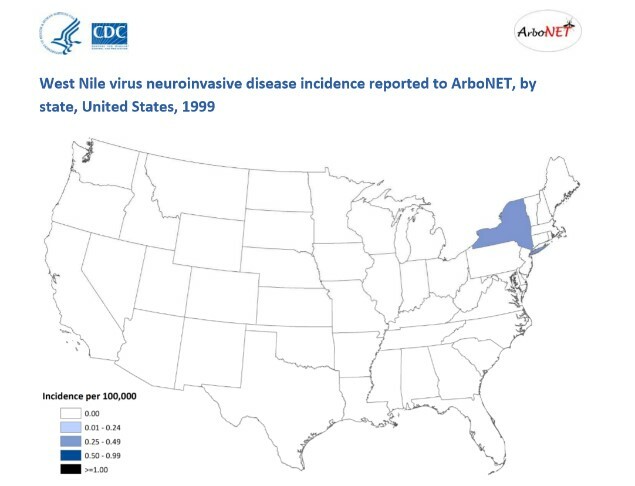 This map shows the incidence of human West Nile virus neuroinvasive disease (e.g., meningitis, encephalitis, or acute flaccid paralysis) by state for 1999 with shading ranging from 0.01‐0.24, 0.25‐0.49, 0.50‐0.99, and greater than 1.00 per 100,000 population. Figure 2: Source: CDC. 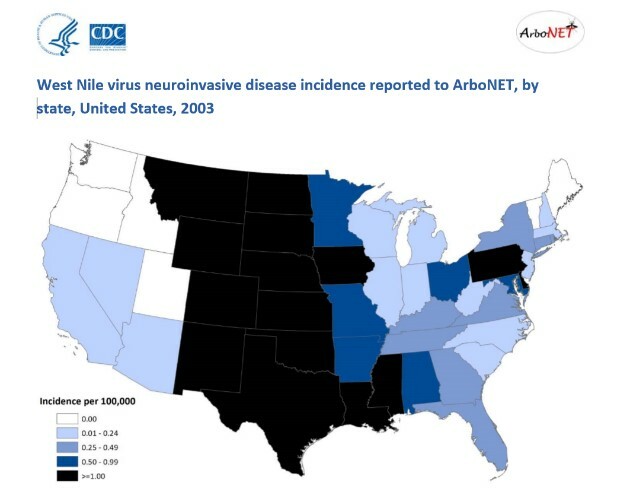 This map shows the incidence of human West Nile virus neuroinvasive disease (e.g., meningitis, encephalitis, or acute flaccid paralysis) by state for 2003 with shading ranging from 0.01‐0.24, 0.25‐0.49, 0.50‐0.99, and greater than 1.00 per 100,000 population. In nature, West Nile virus cycles between birds and mosquitoes. Humans and horses are considered to be “dead end” hosts because they do not develop a high enough viremia to infect biting mosquitoes. There are no medications to treat or vaccines to prevent WNV infection. While the West Nile virus has been detected in the field from 65 species of mosquitoes in 10 genera, Culex mosquitoes, Cx. pipiens (L.), Cx. quinquefasciatus, and Cx. tarsalis (Coquillett), are considered to be the primary vector species and most important in maintaining the virus cycle. WNV has also been isolated multiple times in field-collected Ae. aegypti and Ae. albopictus, but they appear to be of only minor importance with respect to human infections.